There are no better words than from those who have benefited and changed their life experience from a session with HorseHealing Gateway. “Vicki, how can I thank you for such a transformative, affirming, powerful experience. The combination of your intuitiveness and the WindHorse intuitiveness is unbelievable. In retrospect it’s clear to me that the intuitive work of both of you started well before I arrived, even as I was getting dressed in the morning. “I’ve returned home after a magnificent, life-altering adventure with Vicki and her horses. I’m sitting here realizing that I’m finally exhaling. Not from the time spent at WindHorse, but for many years of misperceiving who I am, what I believed about myself and what I believed others thought of me – I am free. “Vicki’s guidance and deep intuitive insights combined with her WindHorse Family brought loving light and clarity, penetrating the complex stories, disbanding the shadows that hid my vulnerabilities. I heard the kindness,love in my own voice, and was able to consciously shift what I believed and say about myself, and how I express my ideas to the outer world. “Vicki, I am not exactly sure how you and the horse did it, but I am awestruck by the accuracy and the shifting that happened so quickly. It was just amazing to experience how the horse responded to me. The Horse’s insights are incredible, Vicki, your intuitive gifts and guidance is invaluable! She is confident and insightful, and her willingness to dive deeper tested my own boundaries. Vicki carries a gentle approach ~ velvet glove and two-by-four. A fine art. I felt her guiding me with humor and honesty so I could see what causes me to become overwhelmed in pain andconfusion. Her communication is clear and her enthusiastic joy and passion is contagious.I am grateful for Vicki reflecting love and compassion so I can see that it was only me standing in my own way. I feel so good, thank you, I like my life again. Can’t wait to partner with you and your WindHorse Family again and see what will happen next!” ~ SP. “A big thanks to Vicki and her WindHorses, first and foremost, as they helped me see my stuff, maybe for the first time, maybe for the fifth time. You and your horses work together beautifully, pointing out areas I have have not been aware of. “I have had one session with Vicki and her WindHorse healing family, it was so powerful and amazing! I have never experienced such rapid progression away from the sobbing mess I was when I arrived, to the happy, dry-eyed light spirit I was when I left. I am an engineer and very pragmatic, so it is difficult for me to connect to others or receive from them. It didn’t matter though, Vicki and her horses are skilled healers and teachers, they broke through my resistance and I was able to release myself of the burden I was carrying. I am not exactly sure how they did it, but my spirit was so light when I left. I really was crying all the time before, and it was embarrassing. I would be sitting in my cube and start to cry, and I would cry all the way home, and cry while I was with my own horse. Since the session with Vicki, those overwhelming, uncontrollable emotions have not returned. I desire greatly to return as I continue my healing journey that was sparked that day, finally I can change my situation. Before I was stuck in indecision and inactivity, but Vicki and her horse got me unstuck and I am able to start to solve some of my problems. I was struggling with migraines and a friend told me about Vicki. I really believe because of the clearing sessions with Vicki I was able to stop taking medication. It was challenging work at times, but very rewarding. Vicki, your insights, deep understanding and knowledge that a symptom is just the external discomfort at the surface level, was a bit hard to swallow at first. Then you took me beyond the symptoms to where the emotions were stuck. “When I feel rusted and need a little oil to get things moving again it is you, Vicki, that I call for my tune up. My worries, doubts and fears disappear as I feel heard and understood. “Having experienced a debilitating depression for several months, I contacted Vicki based on a visit to her website. From the first time we spoke I was aware that she was talking with the part of me that is powerful and makes decisions. Rather than being the least bit daunted by my depressed state, she assured me that, with my willingness, I could break through, the symptoms causing my painful state, and that even after three sessions it was possible to feel great relief. I wondered, but I trusted. I now know that I was making the most difficult journey over the chasm between the ego and the soul. It is clear that Vicki knows the territory and is a courageous, confident guide. 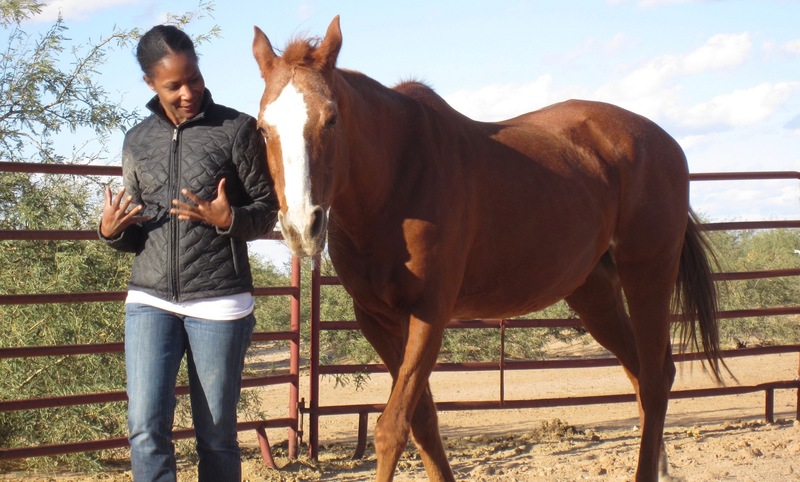 After two hands on clearing sessions with her and then experiencing Vicki’s guidance with one of her incredible horses, I had direct experience with my Higher Self in a life-changing, empowering way that cut through self-doubt and negative self-talk. I realized that the horse was a spotless mirror and assisted me in revealing my True Self. Weeks later, I am still in awe of the realization, and more awareness continues to unfold. “Being riddled with anxiety for years I felt stuck and believing that I couldn’t do things. I avoided situations, I would make excuses. Vicki, you are so good at getting me out of my head and into my heart and body. You gently challenge me to open and see and feel things differently”. “I arrived hoping to get in touch with specific blocks I’ve been keeping hidden from myself. I received more than what I was hoping for. At first I was overwhelmed with the information given from the horses. Vicki, your guidance and honesty helped me see and feel the pain, that caused me overwhelm. Thank you Vicki for your intuitive insights, and clear communication are very effective, I never felt rushed by you or the group. Only felt you gently guiding me to and through the place within where I had perfected avoidance, into embracing my own beauty! “On my drive to the group gathering class I was thinking about acceptance. It has always been challenging for me to connect with others and have felt disconnected. Wanting to really connect and afraid, not even sure why. Vicki, thank you for your joyous guidance, courage and laughter. You didn’t beat around the bush, but made it easy for me to see a “ME” that was there all along!